Hot off the presses, Google Maps for Android version 4.3 has added a couple new features to help you quickly choose the right place to grab dinner, catch the next train, and find friends to add in Latitude. Have you ever had to make a split decision for dinner plans while on the go? Now, you can see a snapshot of what people are saying about places right on search result pages. Instead of poring through full reviews, you can start by looking at what the most frequently mentioned aspects about a place are, such as food, service, atmosphere, or anything else people keep mentioning. Just like on Place Pages for your computer, the color-coded bar gives an overview of how positively people are talking about any individual aspect. Tap one to see more details like the actual review snippets. Whether you’re looking for top-notch service or a vibrant ambiance, you can now pick just the right place to go. 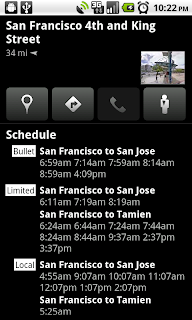 You’ll also find a new addition to public transit station pages: upcoming schedules. 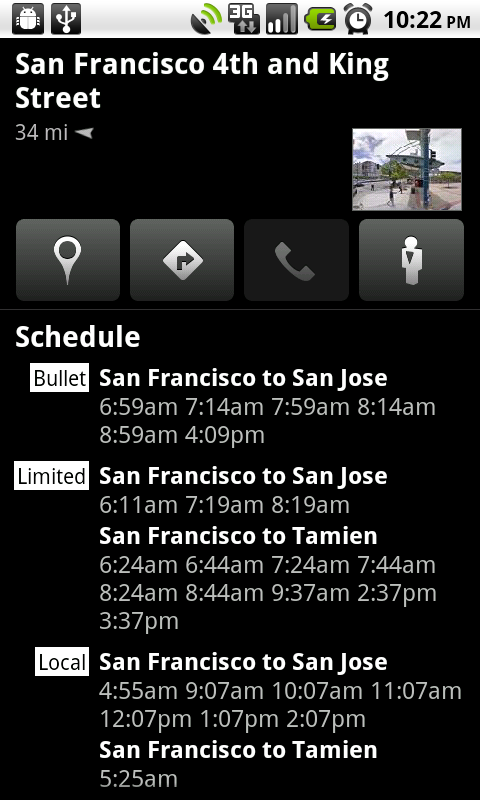 Select any transit station icon directly from the map and open its page by tapping the window. You’ll find a handy list of the next departure times for any subways, trains, or buses that are leaving from that station where transit info is available. In Google Latitude, we wanted to make it even easier for you to find friends and family with whom you’d like to share your location. Right at the bottom of your Latitude friend list, you’ll be able to quickly start sharing your location with long lost friends, loved ones, and others from your Google Contacts. 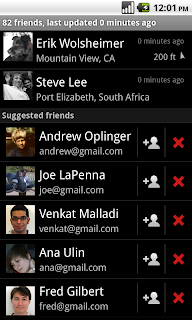 Add any suggested friends by tapping the + icon and sending them a sharing request. Tap the x and they’ll be dropped from your suggested friends list. Don’t worry -- you can always add them later by choosing “Add friends” from the Latitude menu. Get the latest version of Maps by searching for Google Maps in Android Market from Android 1.6+ phones. If you’re reading this on your phone, just tap here. Version 4.3 is available in all the countries and languages where Maps is currently available. First I thought all three features are combined under one screen! Then realized they all needs to be accessed separately! How about integrate these features together? For example, when I pull a location of interest I would like to see the transit information and the friends/family info under each result so I can interact with all these features without leaving the place on the map I am thinking of going! Did I made it clear? Well I am sure you googlers can pick up when I am talking about! Bottom line, I love the work you guys do and want to see your products coming out shining! I noticed that Maps is using the cloud-to-device permission now. What's that for? I don't see the Maps app in Market. What shall I do? Is the Public Transit Times feature going to be pushed out to other international locations such as the UK. We can also use navigation in Google Maps with this update, that is another great feature. I swear to God, if Google Maps on my Droid doesn't stop suggesting I add the same people on my contact list that I've already rejected, I'm going to sign out of Latitude and never use it again. I like Latitude, but the picture attached to My Location takes up so much space I can't see the roads around me. How do I get it to go away? Google maps 4.3 update. I was very happy to see the update on the market. Right away, I installed the update. When I tapped the nearest transit service from my location, it showed only outbound service, there was no way to see the inbound service. At some transit places for bus/train/subway, only buses are shown or only trains are shown and not all. I used google maps earlier to find out the next schedule departure by tapping the transit place, then tapping "Transit service at this place". At that time it showed me all sort of service incl. inbound/outbound/bus/subway. I assume the update is not completely working. I am talking about boston area. Why does this version need permission to record audio? The previous version did voice search fine without that permission, so I assume it is needed for something else. 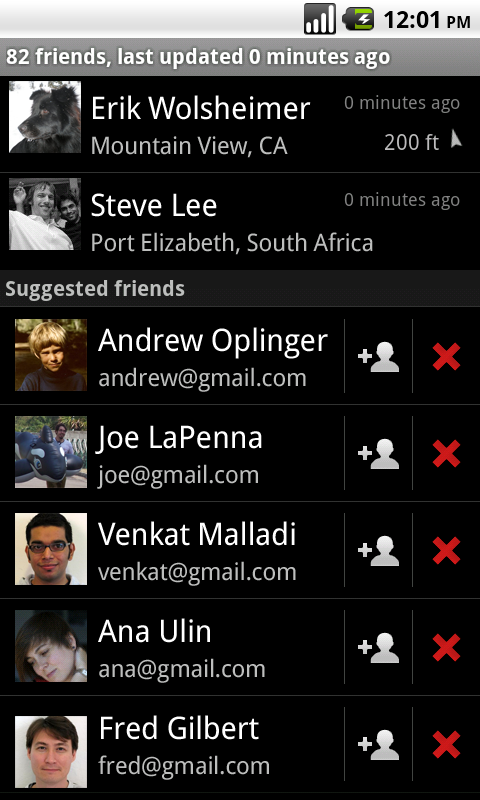 What about bookmarking or being able to star locations directly from android (moto droid here)? show public transit only if actually available that day, or better, within the next hour or half-hour. When it will be available to Brazilian market? I have one Motorola Droid and when I click on google maps, I saw no update available and I saw that I have the version 4.2.0. I forgot to mention that my Droid is running Android 2.0. The transit listing is awesome! The bus schedules in Pittsburgh are not posted at bus stops. Before now, the only way I could get the schedules was to download a series of poorly-exposed PDF files from Port Authority's website (and the only reasonable way to get at these was to Google search for them from my Google phone). Now I can get at the schedules directly without any nonsense. I have found he map's update. Thanks!!! how come we're not seeing this for the iPhone? an even better feature would be an option to send a location (and/or directions) from the Google Maps app on my computer to the phone without the need to resort to emailing myself. Also nice, would be to have my save places (from the normal google maps) show up in the mobile version. So, I don't have to carry paper to re-search everytime. Since downloading Google Maps version 4.305 on my Motorola Droid running Android version 2.1, it is constantly "search for GPS". Now navigation does not work, even after I uninstalled the update. Is there a fix out there? The other error tells you to go straight in a crossing and then making a u-turn followed by a right turn, - in stead of just turning left in a crossing between two streets. Both errors I can connect to specific geographic addresses. The navigation saved my life this weekend. I like the female voice but would it be too greedy of me to ask if the voices can be configured? This is one of the reasons I considered buying a Tom Tom. Darth Vader telling you where to go is kind of cool. Perhaps we could add some Peter Griffin to guide us? Cheers. Is this or will it be available for the Blackberry Tour? I was traveling with a friend and she had this on her Droid and it was awesome. This is great but can you please, please, please, add the ability to drop pins in Android Google Maps. I was able to do this on my old WM phone, on my iPad, why I cant do it on my Google Android phone... anyways please add it!!!!!!!!!! Please share how we can disable this utterly broken "Suggested friends" 'feature' in Latitude. I am going to ask this again since the other people who asked were ignored. Why can I not find this in the android marketplace? When I search I get a messagee that it can not be found, or that it does not exist. C'mon Google, you can't find your own software, and I'm supposed to use you to find other stuff? Then you ignore request for help to find your stuff. I thought AT&T was bad for blocking half the stuff I've tried to install (yes I am already mad about the marketplacee). Google does not block apps, they just can't find them. I guess I am runnung the wrong version of android (1.6), or something, or AT&T has blocked it, because of their navigator app ($5/mo). the maps all the time for no reason, is is too much to ask? U r doing a very well job bt still I want more and more info about Micromax mobile.Because i want to buy the best cellphone of micromax.